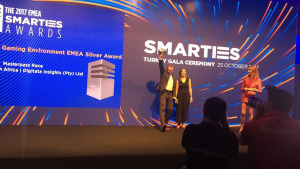 Digitata Insights has received global recognition for its 'Mastercard Masterpass' mobile gamification campaign, winning a Silver trophy at the 2017 Mobile Marketing Association (MMA) EMEA Smarties Awards. The MMA is a leading global non-profit trade association comprised of more than 800 member-companies, from nearly 50 countries around the world. The MMA’s aim is to accelerate the transformation and innovation of marketing through mobile, driving business growth with closer and stronger consumer engagement. At the annual MMA EMEA Smarties Awards gala ceremony, held on Wednesday, 25 October at Swissotel The Bosphorus in Istanbul, Turkey, the association once again celebrated excellence, innovation, and effectiveness in mobile marketing. In its first year entering the awards, Digitata Insights was the only mobile marketing provider shortlisted for two campaigns in the Marketing within a Mobile Gaming Environment category. Digitata Insights is a subsidiary of Digitata Limited, part of 4Sight Holdings group, which is listed on the Johannesburg Stock Exchange AltX board. "We feel privileged to be recognised alongside our clients, and among the most highly respected agencies and brands in the world," says Richard Walton, chief executive officer at Digitata Insights. "To have two campaigns make the shortlist is truly a phenomenal achievement, of which we're extremely proud." It was the innovative Unstructured Supplementary Service Data (USSD) mobile gamification campaign titled 'The Masterpass Race' – created and executed for Masterpass, the global digital payment service from Mastercard – that won Digitata Insights its first MMA Smarties Award. The aim of the gamification campaign was to educate South Africans on the benefits of making safe, secure, and fast payments with Masterpass across digital payment channels including airtime top-up, online purchases, bill payments, and in-store payments. Digitata Insights developed a unique USSD-based gaming service using the company's mobile gaming platform. "Text-based USSD was the ideal channel as most mobile users are familiar with the *111# service. It's also a prolific channel because it is both device and network agnostic, offering the potential to deliver bespoke content to a massive market, all without the subscriber incurring any charges as no data is required," says Walton. The 'Masterpass Race', developed by Digitata Insights, took the form of an interactive virtual 'Amazing Race', which aimed to ensure continued engagement. The campaign saw 688 749 people start the race, and 252 972 players complete the game. To participate, subscribers had to dial a USSD short code. Players earned points for answering questions relating to information supplied in the game about mobile and cashless payments, and about Masterpass, and completed actions such as downloading and using the Masterpass app. Accumulating points allowed players to move to the next level of the game, and points could be converted into airtime. "We were extremely pleased with the results achieved through the campaign," adds Gabriël Swanepoel, vice president of product development and innovation for Mastercard South Africa. "Our main aim was to find an effective and engaging way to educate consumers about the security features and the ease and convenience of using digital payments instead of cash." "What Digitata Insights delivered was a fun and engaging way to convey this message, while also incentivising consumers to download and use the Masterpass app. We are excited that the success of our partnership has been recognised and rewarded with this prestigious industry accolade," says Swanepoel. Swanepoel says that as the only USSD-based mobile campaign to win an award, this recognition serves as a powerful and important endorsement for a mobile marketing platform that has been around for over 15 years. "The perception that pervades the broader industry is one of a lack of sophistication in feature phones. Brands and marketer, therefore, tend to discount the value and potential impact that USSD-based mobile engagement campaigns can have," Swanepoel adds. "The fact is that, at least within Africa and other emerging markets, feature phones are the dominant mobile device in use. While the ability to implement elaborate multimedia campaigns is limited, with the correct strategy and creative approach, USSD-based mobile marketing offers a rich, personal, and highly impactful targeted platform to reach and engage with the majority of consumers in the developing world," concludes Swanepoel. For more information, visit www.digitata.com. Alternatively, connect with them on Facebook.